Travel is an endless source of inspiration (and wisdom) and I find nothing more inspiring than meeting people during my travels who are so passionate about what they do. On my recent trip to Reggio Emilia [map], I had the opportunity to meet a crowd of people who share one passion: Lambrusco. For those of us who live outside Italy, the Lambrusco we probably know are the cheap, frizzy, characterless varieties we find in our supermarkets, and that’s a pity because the ‘real thing’ is a feast for the senses! The colours of a Lambrusco range from deep ruby red to purple. When poured, a shimmering foam of bubbles produces a soft effervescent hiss – the first sign of the wine’s character. This audio-visual treat is then followed by a fragrant bouquet, intense fruity flavours and a slightly bitter finish. There are two types of Lambrusco: dry (‘secco’) and sweet (‘amabile’) – my favourite is the dry variety. Lambrusco producers from all over the province descended upon the majestic Teatro Municipale in Reggio Emilia for the annual ‘Matilde di Canossa’ – Terre di Lambrusco wine competition. I gasped as I entered the theater. It was easily one of the most visually breathtaking theaters I’ve ever been in. That ceiling alone! I later found out that Luciano Pavarotti made his stage debut in this theater many years ago. The stunning Teatro Municipale in Reggio Emilia. The prize ceremony was held in an adjacent hall and when we entered, we found hundreds of wine-makers and press gathered for the ceremony. The crowd’s excitement was almost tangible. We were provided with headphones for the translation service and during the ceremony, we were invited to present the prizes in a variety of categories. I felt honoured to present a few prizes! After the ceremony, everyone was invited into another hall where all the wines were presented – definitely one of the most impressive wine-tastings I’ve ever been to! There were more than a hundred Lambrusco’s to taste! Several wine-makers introduced themselves to me and we started chatting about their vineyards and Lambrusco. From the micro-vineyards to the larger estates, everyone I spoke to had one thing in common: their love for Lambrusco! Despite the language barrier, the twinkling in their eyes as they spoke about their wines and the country lifestyle gave it away in an instant. As we chatted, I couldn’t help but admire these people and their unwavering dedication to this laborious work. We love bubbles! What is life without bubbles? Flat! Can’t disagree with that! 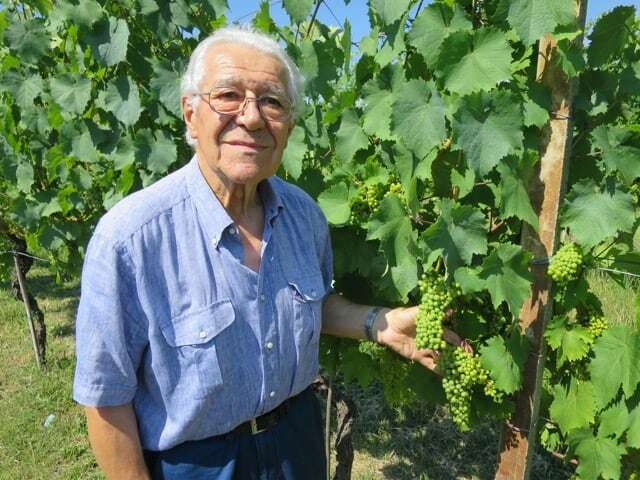 [Listen to Gian Paulo speak about the life and wines in Reggio Emilia]. We soon arrived at the Casali Viticultori estate just outside Scandiano. Casali is one of the largest sparkling wine (Lambrusco and Spumanti) producers in the region and exports its wines to 30-odd countries. We were met by Massimo Casali, an equally bubbly 80-year-old – I was beginning to see Gian Paolo’s point about bubbles – who proudly showed us around his vineyard. “I find happiness in my vines”, he said. It was a joy to observe him as we strolled around the vineyard. He spoke with such vigour and stopped frequently to point out the different Lambrusco and Spergola vines or to inspect the leaves and grapes. He was like a kid in a candy store and his enthusiasm was infectious. Massimo Casali proudly showing us the vines. We were soon ushered into the tasting room where we were treated to Casali’s gorgeous Lambrusco’s and Spumanti. The deep ruby-red colour of the Lambrusco was simply bewitching whilst the rich cherry and cassis flavours reminded me of a bright summer day! Gian Paolo and Massimo pose with an ancient stone tablet that was found at the estate. After the tasting, Gian Paolo took us out for lunch in Scandiano, a picturesque village dominated by an imposing castle. We had lunch at the Osteria in Scandiano, a restaurant I can highly recommend if you’re in the area. The gnocco (fried puffy dough) combined with culatello (the heart of a Parmaham) was the perfect starter. This was followed by a delicious pasta with seabass and concluded with a heavenly meringue/chocolate mousse dessert aptly called the ‘hamburger’! Our terrific lunch at Osteria in Scandiano. A group photo just before we attacked that meringue! It was an absolute delight to meet Gian Paolo and Massimo and listen to them speak about Lambrusco. I found their passion and enthusiasm reinvigorating, and a great reminder of why I love to travel! Read more about my experiences in the Italian region of Emilia Romagna. Reggio Emilia and Scandiano are featured destinations in the Ultimate Euro Food Trip. Note: my visit to Emilia Romagna was part of the Blogville project, a collaboration between the Emilia-Romagna Tourism Board and iambassador. All views expressed above are mine, and mine only. We’ve loved sipping Prosecco in Venice. Thanks now for educating us about Lambrusco! Sipping Lambrusco in the Reggio Emilia region looks enticing :-). Oh, it’s lovely! Definitely something to do whenever you’re in Emilia Romagna. The Lambrusco’s there are amazing!